WAIST HIGH: Sweat: The Story Of The Fleshtones. Sweat: The Story Of The Fleshtones. May of 2006 marked the Fleshtones' 30th anniversary as the only band from the mid-70s New York City Punk/New Wave scene that hasn't had an inactive year. In that time they've amassed an incredible history—they shared a practice space with the Cramps in the 70s, they shared a label (IRS) with R.E.M. in the 80s, and the likes of Steve Albini and Peter Buck have produced them. They've opened for James Brown and Chuck Berry, played at the same summer festivals as Iggy Pop. Sweat is not the typical rock & roll story of stars, stacks of money, or wild, unbridled triumphs; it's the story of a band that has reached the threshold of fame many times over, but never quite made it; a band that contributed to numerous sea changes in the New York City music scene, but unlike many of the bands around them, didn't come out the other side famous or drenched in cool. Sweat is a bare-knuckled, compelling account of road-paving rock & roll played in the real world, where success measured over the long haul is redefined each and every hard-won morning and where patience, vision and determination do not always lead to prosperity. 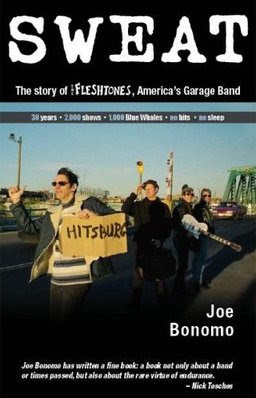 Join author Joe Bonomo as he guides you through the peaks and valleys of the Fleshtones' impressive career, and enjoy an insider's view of three decades in New York City's music scene along the way. Sweat is more than just the story of a band, it's a rock & roll allegory for anyone who has ever persevered in the face of adversity, and the soul sucking pressure of the status quo, to continue to do what they loved.